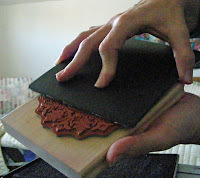 Spray the surface of the stamp with Stampin' Mist. Hold the stamp in your hand, take the cleaning pad from your Stampin' Scrub and scrub. Do the same with the dry pad from the Stampin' Scrub. I find this easier on the hands and you get a clean stamp the first time. Speaking of the Medalion stamp, to get the effect on the card above, I stamped the outside quarter circles with Versamark. 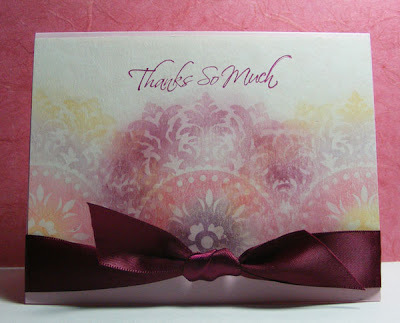 Then I used light shades of Stampin' Pastels to go over those designs. Lastly, I stamped the half circle design in the middle of the paper and used darker shades of Stampin' Pastels on this design. In all cases, I inked the stamp rubber side up. I applied the paper to the stamp so I could see exactly where my image would appear on the paper.